Western Rye Grass is perennial with a very short rootstock not creeping, like that of Couch Grass, which Western Rye in other respects closely resembles. On account of the shortness of the rootstock, the stems and shoots become crowded and the whole plant grows in dense tufts. Western Rye is therefore a bunch grass. Besides a great number of strong roots from the short underground rootstocks, numerous stems and sterile shoots are produced. Both stems and sterile shoots are strictly upright, the former being from two to four feet high, the latter varying with individual plants and in different localities. Western Rye Grass varies in many other respects. Thus the foliage of some individuals is poor and confined almost entirely to the base of the plant, whereas in others it is about as rich as that of ordinary Timothy and distributed along the stems to above the middle. Plants with narrow, dry leaves may be found growing beside individuals with broad and rather soft leaves; and greyish or bluish-green plants occur side by side with bright green ones. The flowers are in a long, spike-like inflorescence which has the flattened spikelets solitary at each joint and thus somewhat resembles that of Perennial and Italian Rye Grass. As the two latter grasses turn the narrow side of the spikelets toward the main stem, whereas the spikelets of Western Rye (like those of all other species of the genus Agropyron) turn their broad side toward the main stem, there is little danger of confusion. Moreover, in the spikelets of a species of Agropyron there are two sterile glumes; whereas the species of the genus Lolium have only one sterile glume. In Western Rye the two sterile glumes are about as long as the whole spikelet and sometimes enclose it completely. The spikelets are always strongly appressed to the main stem, making the whole inflorescence narrow and slender-hence the name Slender Wheat Grass. At first they are green but toward ripening time they turn straw-coloured. 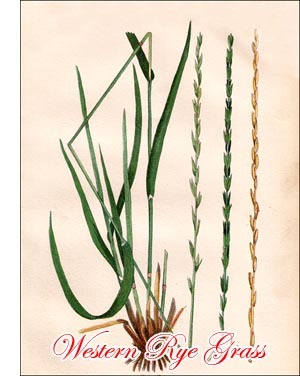 A spikelet generally contains from four to six flowers, each enclosed within two glumes. The outer glume is similar in shape and texture to the sterile glumes at the base of the spikelet. It is generally awnless but sometimes carries a short awn at its top. It is indigenous to all Canada, from coast to coast, and to the northern and western parts of the United States. As its name indicates, it is especially common in the west, extending from the dry belts of British Columbia to New Mexico and southern California. Western Rye Grass grows naturally in dry soil and thrives best where only a limited amount of water is available. It cannot stand long flooding but responds readily to careful irrigation. It is one of the few grasses that are not checked by a large amount of alkali in the ground. The root being rather deep and very strong, it stands severe drought without injury. It is insusceptible to extreme cold, and, generally speaking, bears unfavourable climatic conditions better than most other fodder grasses. It is easy to grow and makes a ready start from the seed. If sown in spring, it is well-established in one season and might, if conditions are favourable, head out late in the fall of the same year. It generally gives the heaviest crop the third year, the yield depending to a certain extent on the amount of seed sown. It is no doubt the most valuable of the western native hay grasses, and, like most other fodder grasses, includes many different types. Some of them give only a small quantity of poor fodder; others produce much nutritious, succulent hay. As grown at present, Western Rye is a mixture of types and the return is therefore comparatively small. By proper selection and breeding, varieties could be produced which in yield and nutritive value would far surpass the average grass now grown in the Prairie Provinces. Western Rye is preferably a hay grass. It should be cut just when it begins to bloom, or even earlier, as it is most palatable and has its greatest nutritive value before flowering. After that it becomes tough, hard and decidedly woody. Only one crop of hay can be taken each year. It has its greatest value as horse feed. It is, however, not as much relished as is the hay from Brome Grass, perhaps because the types now grown have rather poor foliage on the stems. It is of little value for pasture, as the second growth is poor. When sown alone, ten to fifteen pounds of good seed should be used to the acre. No advantage in yield is gained by seeding more thickly on dry soils; on the contrary, it is apt to lessen the yield in succeeding years.